Roadhouse Innovation, designers of road safety devices, has partnered with Human Technologies to bring the Move Over Alert System™ to market. Mark Blask, president of Roadhouse Innovation, was moved to action after a driver ignoring New York State’s Move Over law sideswiped a tow truck and struck and killed Thruway maintenance worker Ronald C. Deming, a life-long Little Falls resident, as he was assisting in the recovery of a passenger car from a previous accident on the side of the highway in Herkimer County. Ron left behind a wife and two daughters. His death rocked the city of Little Falls. “This tragedy sparked conversations with my friend and associate Justin Welyczko about how thruway worker deaths and injuries were on the increase, despite the Move Over law now including all emergency response vehicles. We decided to design a device that more effective in encouraging drivers to move into the unaffected lane when approaching an emergency or maintenance vehicle on the side of the road”. The Move Over Alert System™ (MOAS) is born. The MOAS is a 27” retractable light bar permanently mounted to the vehicle’s left rear quarter panel which is operated from a button on the dashboard. 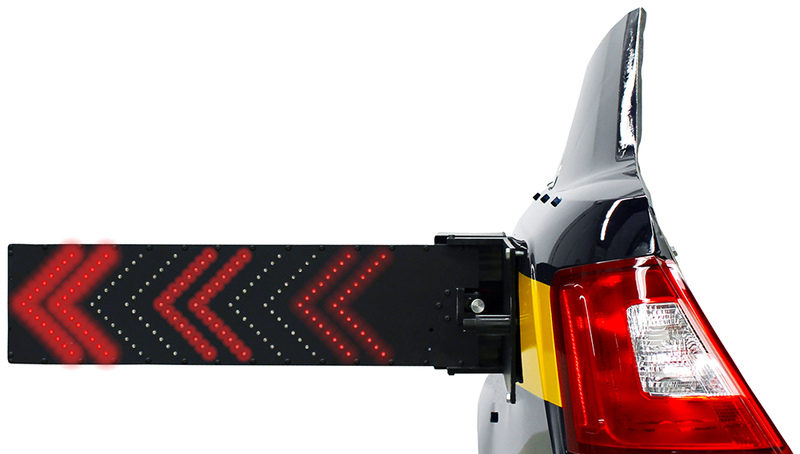 The bar contains sequential LED lights in the shape of arrows which direct oncoming traffic away from the stopped vehicle. The light bar extending from the stopped vehicle coupled with the sequential arrow warning lights plays to a driver’s subconscious. We are all trained to move over when we see sequential arrows pointing in a particular direction. And when seen from a distance, lane indecision is eliminated. Accident reports indicate State Troopers are struck by vehicle side mirrors more often than by the vehicle’s body. In response, the MOAS also provides an audio warning. If the light bar is contacted by an oncoming vehicle, the stopped vehicle’s horn will sound, providing some measure of warning and allowing for the emergency responder or maintenance worker time to jump out of the way. The MOAS is stowed by pressing the same button that deployed it. In the event the operator forgets to press the button, it will automatically retract to its original position once the vehicle is put into drive. Roadhouse Innovation has met with the New York State Police and the New York Department of Transportation, both of whom have expressed great interest in piloting the product, and have provided invaluable feedback on the design. Pilots have been schedules with several municipal sheriff and Department of Public Works in central New York. MOAS has patents pending. Human Technologies will be providing electro-mechanical manufacturing, quality engineering, warehousing and distribution, marketing, and administrative support, helping bring the MOAS to law enforcement, emergency responder, and road maintenance markets throughout the northeast.